I went to some public land on 14 Oct and set up my climber at a creek crossing. I was in the stand about an hour when a wasp stung me just for the fun of it. About an hour went by and all of a sudden I had about 12 wasps buzzing me. It was time to go deer or no deer. Since I had two hours before dark I decided to leave the climber in the truck and do some scouting. I found a nice trail and leaned up against a tree about 15 yards away. With about 45 minutes of daylight left I saw this doe coming down the trail. As she got closer she actually left the trail and began going to my right. Not what I was planning and she was only about 5 yards away at one point. For whatever reason she changed her mind and started walking back down the trail again. When she stepped into the exact spot I had picked to shoot a deer if I saw one I drew hit anchor and released. I was standing on the ground and I shot her at about 12 yards. The arrow passed through and I saw a spray of mist come out from the far shoulder. She took off at a dead run but piled up at 90 yards. It was a very quick death and I am thankful for that. 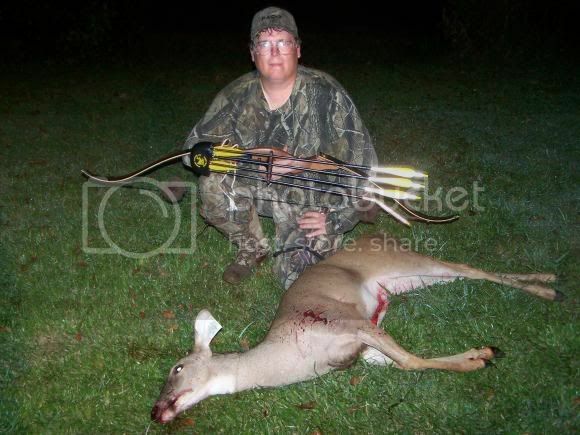 I was shooting my PSE Impala, 50 lbs @ 28". Arrow was a 2016 and I used a 125 gr 2 blade Magnus. I want to thank all of you that have helped me accomplish this goal. You folks are the best. Outstanding start to a, hopefully, long and enjoyable future in traditional hunting. The way our forefathers did it for hundreds of years. Congratulations! Great shot. There's nothing like getting them on the ground! great job , a deer off the ground with traditional gear too! fantastic. I had this posted at powwow but had to search to find it. Then I saw this page and it looked like the correct one to post on. Out of over 5o deer taken in my lifetime this average doe took more effort on my part than any other. I'm very proud of her and never will forget that hunt. Way cool!!!! I bet your hooked for life now! !